So. I have to admit: sometimes, like most people, I’m afraid to say no. I don’t know why. I don’t have problems whipping out my inner beyotch and putting people in their place. I certainly don’t have problems exhibiting awful road rage that may or may not include my middle finger. But when it comes to saying “no”, at times, I have issues. Case in point: a few days ago after a particularly busy day at work, I decided to visit my nearest ULTA store to pick up some fancy new nail polishes since I’m currently going through a psycho-nail-painting phase that involves painting my nails a new style and/or color every couple days to keep things fresh and avoid chips, which literally make me batty with rage. Did I mention my lovely BFF Katrina had given me a $30 gift card for my birthday? Hell yeah, free beauty cash. After exploring hundreds of shades to find the perfect baby blue (Revlon) I decided to peruse the Urban Decay section, you know–just ’cause. Going into this, you need to know I have THREE of UD’s Book of Shadows palettes, plus two mini-palettes, plus a half-bottle left of their primer potion, plus about a zillion other beauty products by other brands and therefore, am sitting very pretty on the figurative cosmetic throne. I. Do. Not. Need. Makeup. And those people who say “I don’t need it” but buy it anyway? I’m down for “not needing” anymore nautical clothes or funky necklaces. But when it comes to makeup, really–I’m good. Not to mention, just two weeks ago I went to the Dollar Tree and for some knick-knacks and happened upon an LA Colors eyeshadow trio with the sexiest, brightest purple evah. And I just so happened to have recently used up all my UD Flash shadow. So I bought the $1 palette and what do you know, it works EXACTLY like UD. For a dollah. And I praised myself for my experimental, cheap!! purchase and even told my FB friends who praised me on my find. So WHY did I find myself staring face-to-face at the eyeshadow palettes?! WHY did I engage in conversation with the slightly-overweight, caked-foundation-wearing UD rep who insisted I buy the new Naked 2 palette for triple the rewards points (and $50)? I don’t know, but I’m blaming ULTA for making their store like a gateway tunnel to hell. Where ‘hell’ is a place where girls wear heinous amounts of makeup and everything smells like vanilla and berries. And Justin Bieber plays on the speakers. You’re talking to the girl who formerly had green hair. I def. don’t need some brown eye shadow to “tone it down.” But thanks. Yet somehow in that moment of time, I became slightly mesmerized by the different shades of brown. Brown! I could use brown eye shadows, I thought. I could mix ’em up and make them look cool and different and hip. I could be naked, too (ha). Then CakeFace sweetened the deal by offering to give me a free gift bag filled with travel-sized goodies for free if I spent $75. So I walked out spending $50 on makeup. When I didn’t need any. How did I say yes? Why didn’t I say no? Guilty, I told FB and my friends gawked and practically turned my computer screen green with jealousy. How did you get the palette, the primer and a free bag of goodies for $50?! they wondered. I tried to justify my purchase over the next couple days, getting stoked to do my makeup. But whenever I’d open the palette, all I’d see was brown. Brown, taupe, slightly darker taupe… uhhh, where’s the teal? Or the flashy green? No pinks? This was all such a stupid experience because if I would have said “no” from the get-go, CakeFace would have maybe been pissed for a minute, but would have pawned off some browns and taupes to another eager schmuck like me in twenty minutes. I don’t have to deal with CakeFace ever again. Why did I say yes? I pondered this question of my psyche over these brownies. 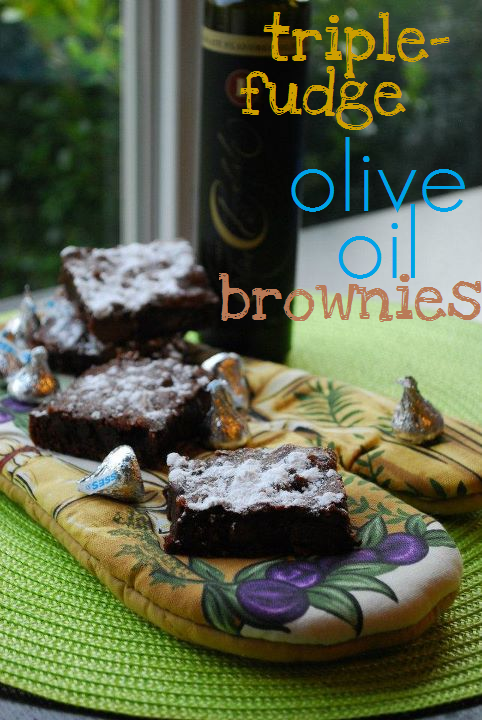 I made them with Lucero Olive Oil’s Chocolate Olive Oil… the one I’m giving away HERE, guilt-free. 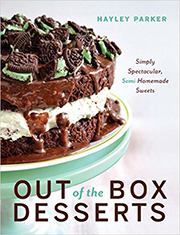 Olive oil adds a certain richness to dishes like chicken and pasta, and it certainly added a level of decadence to the Blackberry Red Wine cupcakes, so why not add it to a box of my favorite brownie mix? It’s like the luxury product in a dollar-store find (hello, UD-like shadow for $1= fancy olive oil brownies). Same diff. 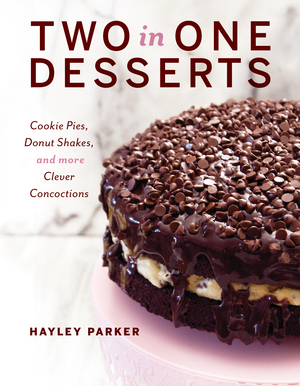 Not surprisingly, they were extra-rich, SUPER decadent and all-around freaking ridiculous. You should win that bottle of oil (it’s really amazing stuff) and make them. And if regular brownies and chocolate-flavored olive oil weren’t enough, welllll, I added some hot fudge and Hershey kisses to the batter. You know, to sweeten the deal. Saying yes doesn’t make you a schmuck. 1. Preheat oven to 350 degrees. Lightly grease a 13×9 inch baking pan with cooking spray. Set aside. 2. 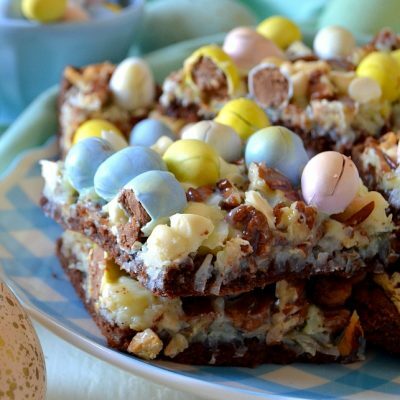 In a large bowl, mix together the brownie mix, oil, water, and eggs until blended. Stir in the hot fudge sauce and the chopped chocolate candies. Pour into prepared pan and bake for approx. 28-30 mins or until a toothpick inserted in the center comes out clean. Cool completely. 3. 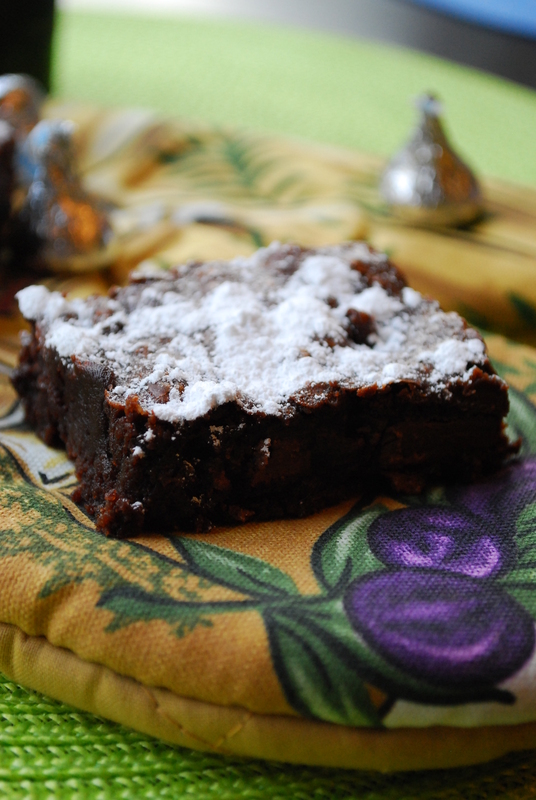 Cut cooled brownies into squares and top with powdered sugar, if desired. Store airtight. 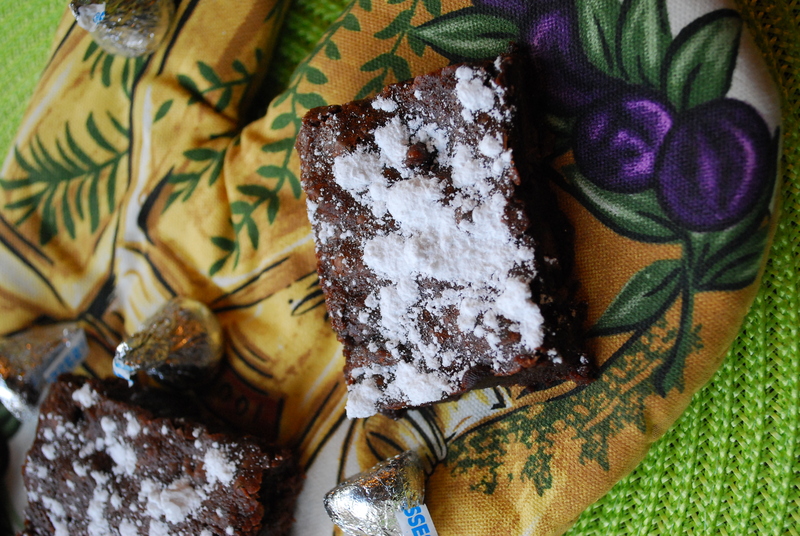 If you’re a fan of ooey, gooey chocolate-y brownies, you must make these ASAP. And if you haven’t already, pretty please enter my olive oil giveaway! 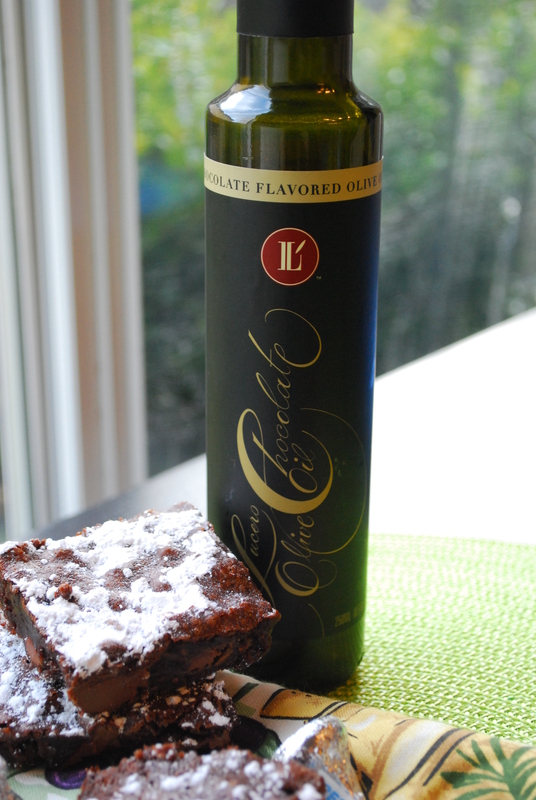 You can win a bottle of Lucero’s tasty chocolate olive oil fo’ free. Be sure to check out their website for more yummy oils, vinegars and mustards (um, it’s going to be easy to rack up a bill–don’t say I didn’t warn you). We just got an Ulta literally five minutes from my house. I totally agree with Dorothy; it’s totally a place of the devil. I don’t even NEED anything and I walk out with a bag FULL of stuff. I’m like you; I have a really hard time saying no–especially when it comes to sparkly makeup or perfume that smells like cupcakes. I’ve been rocking and loving a new color – OPI My Private Jet – this winter. The upkeep makes me want to pull my hair out! Coincidentally it looks like chocolate olive oil with a touch of shimmer!